Sign is actually "illegal" (covenant) but hopefully there will be some discretion there. I love it too. Great job. I love your old stove. I have an old friend - lover that had a stove like that LOL. Who makes that? Thanks. A little late for this year but maybe we could have a continent wide Easter Egg Hunt NEXT year - LOL. The last one of those that "I" went on was in the Ba-you-ya. Much fun. 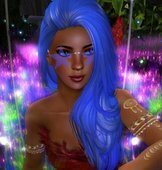 Here is a bit of input from someone who has designed sims for awhile (assume some of you guys have too). It isn't just changing the GROUND texture, it is also changing out the trees and bushes. Yes if the flora was scripted with a UUID that could "maybe" (beyond my techiness - I just do websites) be controlled on the server, BUT it is unlikely that scripted trees would happen as that just adds to lag. So think about 400 regions and all the WORK involved to change things out. Let alone put snow on the rocks etc. I can't see any way that is going to happen -- just from a practical point of view. And then there is the issue of people having "Spring" trees in the middle of winter. And ==== Need I go on LOL. Since the long range plans for Linden Homes is to have TONS eventually, there are all sorts of possibilities of course, but changing out a few continents each season seems to be a remote possibility :D.